Dana Vose has retired from Houlton Regional Hospital after providing over 26 years of service. Dana brought a high degree of skill and commitment to his career providing telecommunication services and general maintenance to Houlton Regional. He plans to enjoy woodworking in his retirement, making shelves and custom corn-hole games for family and friends. 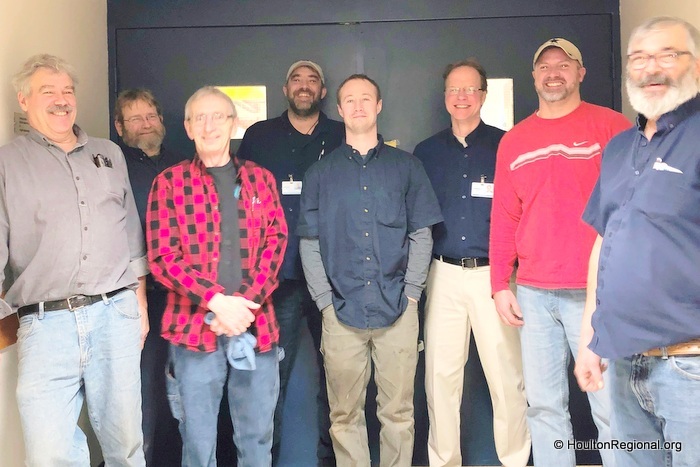 Joining in congratulating Dana (third from left) on a well deserved retirement are from left to right: John Skehan, Tom Estabrook, Dana, Matt Brown, Bill Duffy, Bart Peters, Director of Maintenance, Trevor McLean and Conrad Prosser.